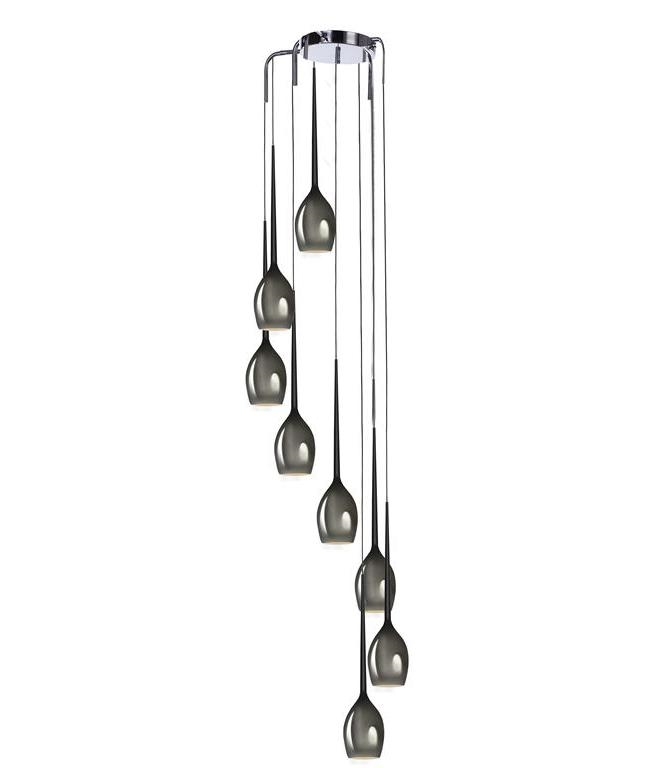 This is a very popular long drop suspension with a cluster of 8 teardrop glass shades offered in five fantastic colours. 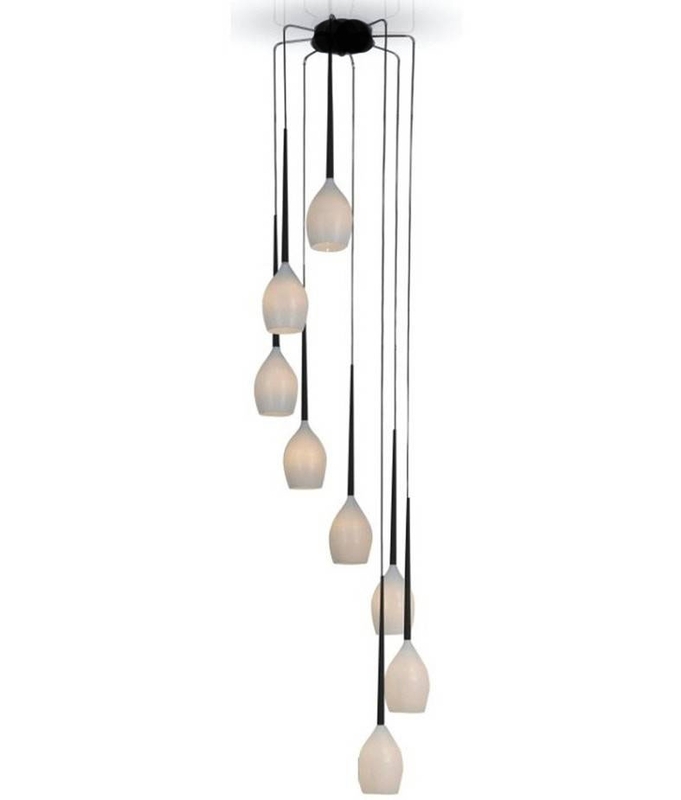 The shades are large, the price is great and with a long drop this pendant is a firm favourite with our customers. We have one on display in our showroom too! Great for atriums, high ceilings, commercial or residential installation. The inside of the glass shades are flashed in a white opal glass and this will provide a good downward light regardless of the shade colour. 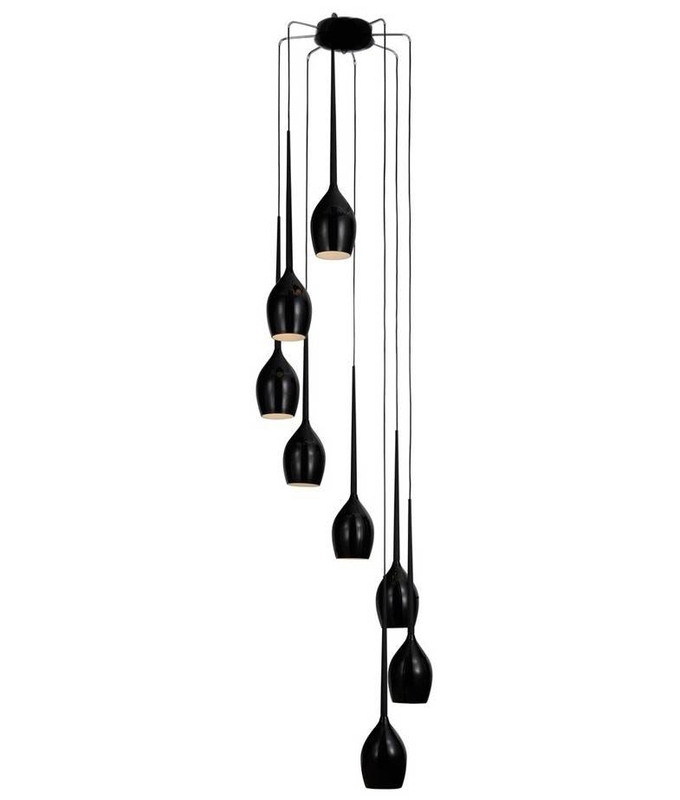 The stylish black flex suspensions are supplied with a length of 2600mm and can be shortened to suit your ceiling height. The ceiling suspension is nicely detailed too with eight spider legs extending out from the round ceiling plate. 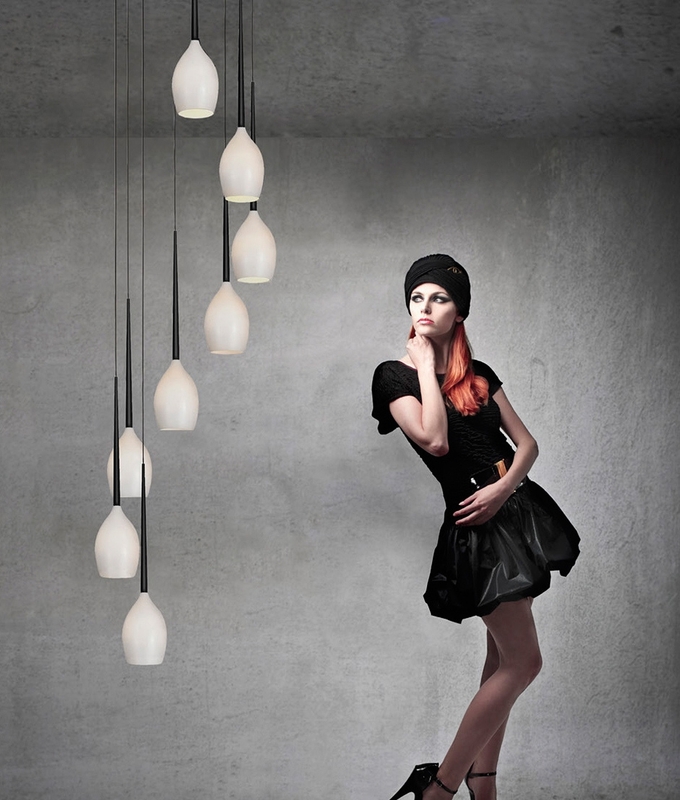 Glass shades are 125mm in diameter and 200mm high. The length of this light is 2800mm (2.8 metres). The white, black and olive all have a black ceiling plate. Amber and smoky has a polished chrome ceiling plate. A 5 light, single, bar pendant and wall light is also available allowing you to mix and match as your space or requirements dictate. Designed for use with mains E14 lamps up to maximum wattage of 40. 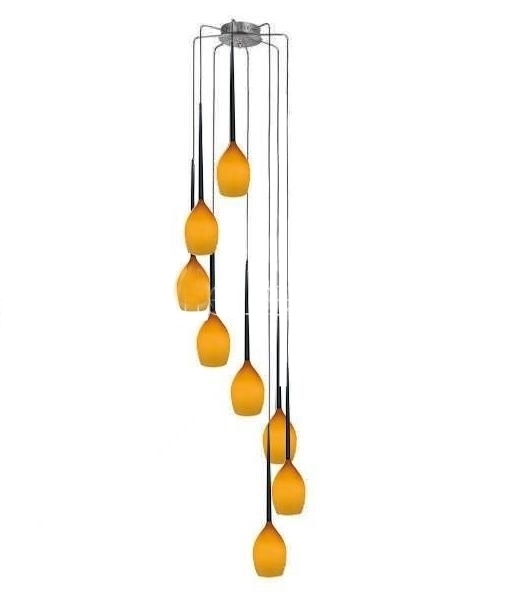 I am looking at the 8 pendant light which would be great for my double height hall, but also need another 3 of the same type, like a single or 3 cluster to hang from an 8ft ceiling. Do you have a shade match for a shorter light? Can you confirm if I could fit dimmable LED bulbs to this product? This fitting uses an E14 base lamp. 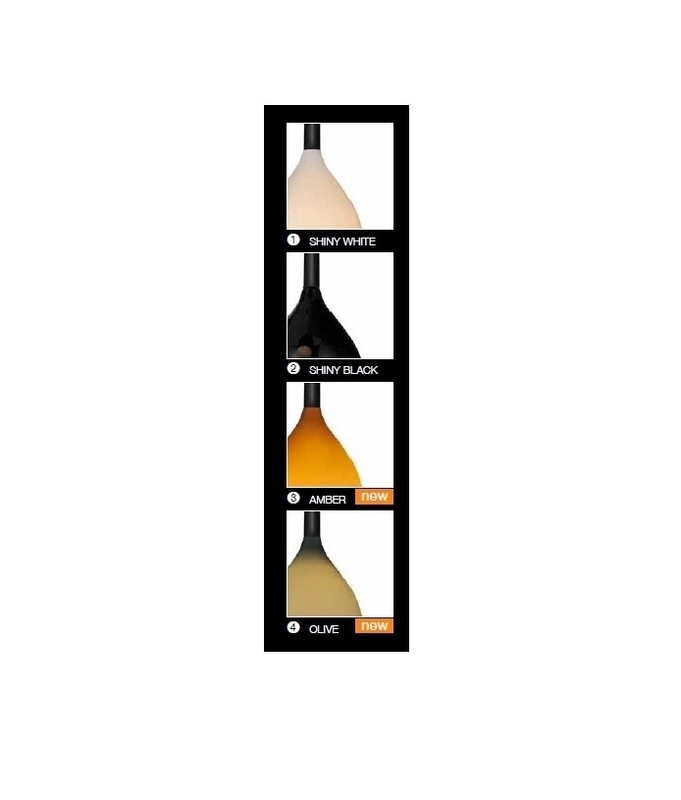 You can use an E14 dimmable LED lamp if you wish. Are the glass shades opaque or translucent? Does any light escape through the sides or is it all directed downward? The shades are opaque (as in not see-through) but some light is still omitted (ambient) light through them. The majority of the light is directed underneath. 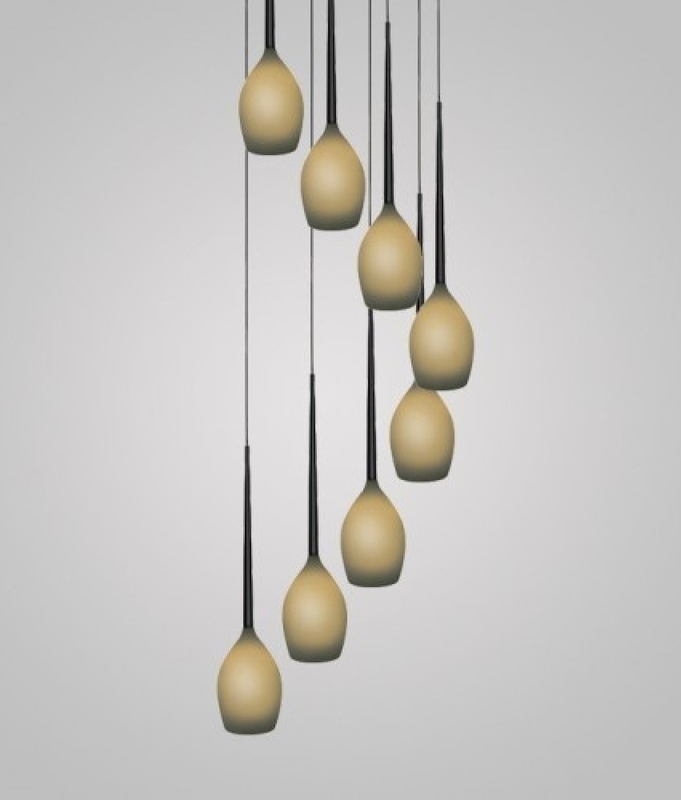 Does this 8 light long drop teardrop fitting come already set up to hang in the configuration shown in the image or do you have to cut or adjust each individual cable yourself? They all come in one length, and you cut them to the length you require. Is there room inside the ceiling rose to fit a 12v transformer? Is this a factory option? 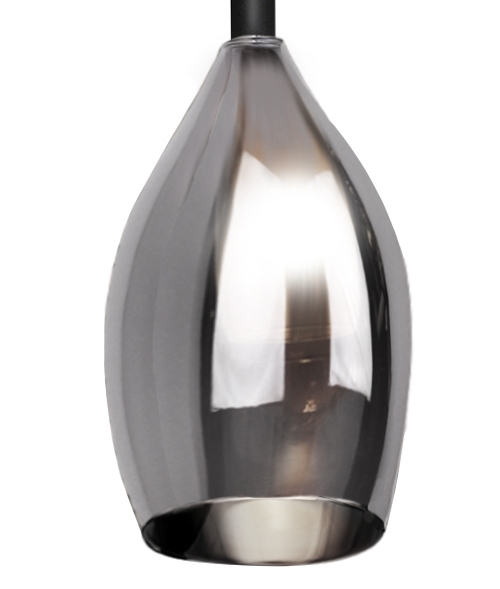 This fixture uses mains voltage small Edison screw lamps. Can you tell me the diameter of the individual lights? The diameter of each shade is 130mm. I am wanting to fit this to a plasterworks ceiling rose, therefore I need to understand exact dimensions of the light fitting rose part. The ceiling rose has a diameter of 180mm, and with the arms it’s 380mm. Can this light fitting be used on a pitched ceiling, approx sloped at 30 degrees? This could be used on a pitched ceiling. The flex can be adjusted at time of installation if required. Could you please tell me the width of the base that fits to the ceiling please? The ceiling rose measures 160mm in diameter at the ceiling point. The plate has an outer lip on the bottom of the rose that measures 180mm. The depth of the rose is 50mm. What's the shortest you could have the flex on this pendant? The lowest length of flex on the last shade would be 1.4 metres. You would then shorted the others to keep with the pattern of the fitting. I think not, but could this fitting be used on a sloped ceiling? Each drop is suspended from a tube shaped like a spider`s leg. These are fixed on the inside with a nut so could be adjusted to hang straight on a sloped ceiling. We would need to know the angle to give a confident answer. Can you confirm what size and type the flex is for the teargas pendants. 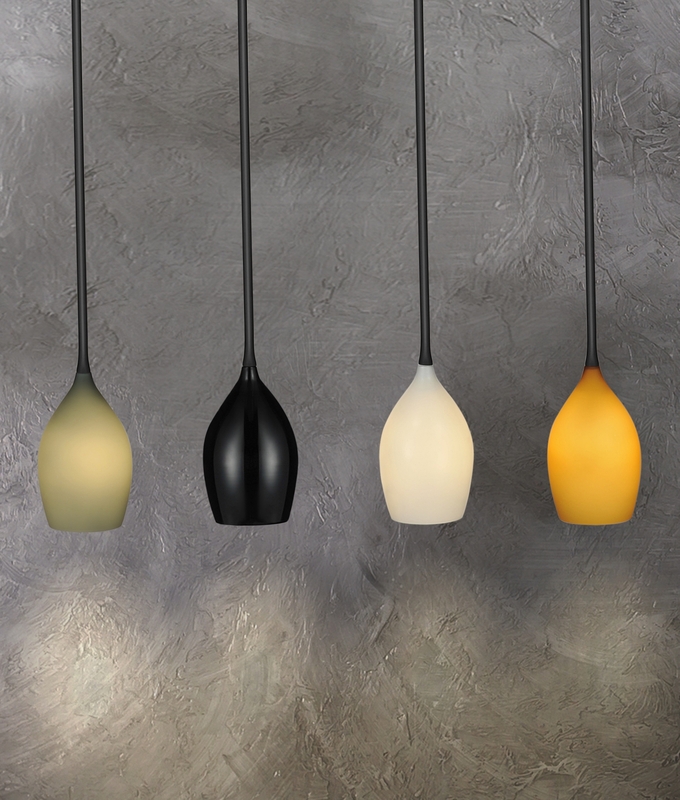 Comes supplied with 2600mm of plastic flex, This can be adjusted at time of installation, But this could effect the appearance overall of the pendant. Are the lights independantly adjustable to give a random effect? Luckily the length of flex can be adjusted to suit the installation. If you don`t want uniformity or symmetry just hang them how you feel. How much does the fitting weigh? The weight of this fitting is 9.2 Kgs. Can the length be increased from 2.6m? If not is there a fixing plate that can suspend the ceiling rose lower in our ceiling void ? The stock product cannot be increased anymore than 2.6m without voiding the warranty. We don`t stock a fixing plate for this product but they may be available. 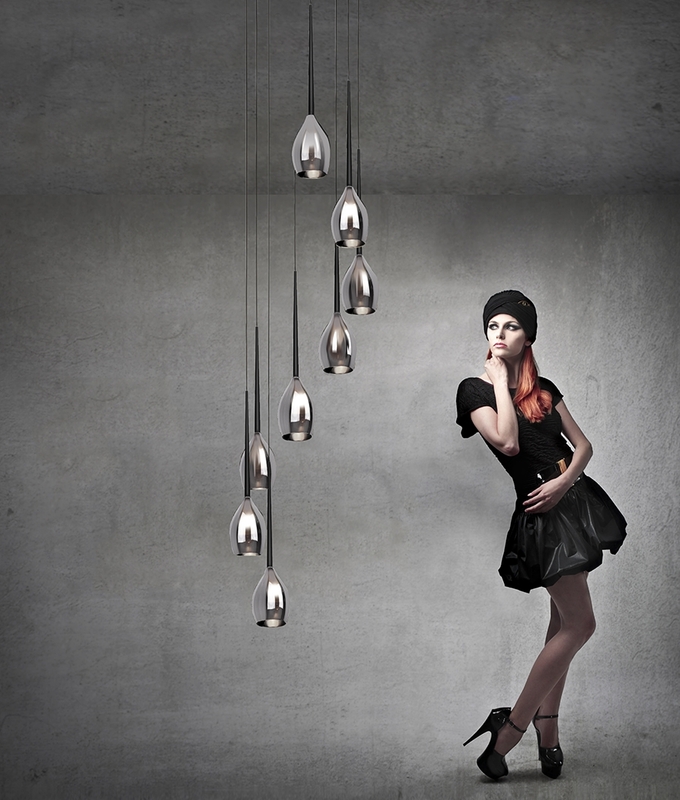 We like the 8 light long tearglass pendant and the matching bar light with four pendants, both in black. Please can you say whether they are designed to take LED bulbs in them and which sort if they do? This fitting uses E14 bulbs, LED equivalents are available as direct replacements but we unfortunately do not stock them. Please could you tell me the diameter of the ceiling rose part of the light where it attaches to the ceiling. what is the width where the `arms` come out too?